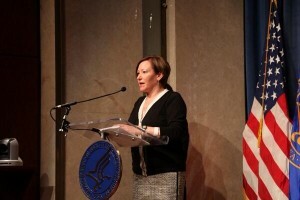 HomeBLOGHow Health Departments Are Addressing the Viral Hepatitis Epidemic in the U.S.
How Health Departments Are Addressing the Viral Hepatitis Epidemic in the U.S.
Maria Courogen, Washington State AIDS Director, speaking at the launch of the updated Viral Hepatitis Action Plan.In my role in Washington State, I oversee the state health department’s work in the areas of HIV, sexually transmitted diseases (STDs), tuberculosis and viral hepatitis. In my role as a member of NASTAD’s Executive Committee and Chair-Elect, I work with state health department colleagues across the country, many of whom have a similar portfolio of work, to provide leadership in the country’s response to HIV and hepatitis. As such, On April 3, I participated in an event hosted by the U.S. Department of Health and Human Services (HHS) for the release of the next iteration of the Viral Hepatitis Action Plan . Have a plan or strategy. National strategies and plans have been very helpful tools at the state level in framing the conversation about response to the disease. My office has pointed to both the National HIV/AIDS Strategy (NHAS) and the Viral Hepatitis Action Plan when talking to our agency leadership and communities about responses to these diseases. Measure your progress. The second tool has been the HIV Care Continuum” in terms of the proportion of people diagnosed, linked to care and in treatment. Now that people are familiar with the idea of the continuum, we are adopting it to frame our work related to viral hepatitis. While we have made a lot of progress in raising the bars for HIV, there is still much to be done in moving the hepatitis care continuum forward. But unlike HIV, this continuum ends in cure. Do your homework. The third tool I have found to be useful is the article recently published in Current Hepatitis Reports about “The Role of Public Health in an Era of All-Oral Therapy for Hepatitis C Infection.” Many health departments are trying to find their footing as the health care delivery system evolves, and this article has helped our Department think about how viral hepatitis can be addressed through the core public health functions of assessment, assurance, and policy development. The updated federal Viral Hepatitis Action Plan. In thinking about the evolving role of public health, we are looking to play the part of “key health strategist,” which is essentially how our viral hepatitis coordinator has been operating in terms of figuring out how to bring populations and systems together and how to influence systems to achieve our public health outcomes. Instead of having just one person function this way in our office, we’re realigning so that we have more staff dedicated to this type of work. Washington is one of a handful of areas to receive CDC funding to enhance our disease surveillance efforts for hepatitis C. 60% of cases reported in the last 5 years were missing race/ethnicity information, and 76% were missing risk data, and we have very little information about linkage to care. We’re using our funding to develop methods to capture more complete data on a representative sample of people diagnosed with hepatitis C. This continues to be a really challenging area for us, as it is for everyone, and most areas do not receive the funding we do right now for surveillance. It’s going to be difficult to describe disparities or effectively target resources, or even construct the bars of a hepatitis C care continuum without having adequate data to do so. Washington is a Medicaid expansion state and is fully embracing the Affordable Care Act. The ACA gives more people access to care, so more opportunities for diagnosis and treatment. It also brought an influx of health information technology that can potentially help us get more information about disease more efficiently, helping us with some of the surveillance challenges I just mentioned. Last year, the preventive screening guidelines were updated so that screening for baby boomers and people at risk could be covered by insurance with no additional costs to the patient. My office has been investing in promising models of practice. One is a project that uses the electronic medical record platform in a large clinical system to flag people who need to be screened for viral hepatitis, as well as other infectious diseases, in a routine way. The other is Project ECHO, a telemedicine model out of the University of Washington, which we are using to boost the capacity of physicians to treat disease, both in rural areas as well as underserved urban areas. We’re working with our partners to link people testing positive for hepatitis C in public health settings to care in community health centers, and we’re linking these community health centers to the ECHO project so there is provider capacity to treat hepatitis. We’re working to find ways to scale up both of these models. As part of the State Innovation Models initiative through the Centers for Medicare and Medicaid Services (CMS), Washington is creating a State Health Care Innovation Plan that has a focus on chronic disease, people with complex medical conditions and people with physical/mental/behavioral health issues. The plan also addresses structures to support provider practice improvement and workforce development, which includes use of telemedicine. We’re staying involved in the development of this plan so we can understand what opportunities there are for addressing the needs of our populations. We are also working within our own health department with our chronic disease partners who have common interests in motivating people to get cancer screening, in provider practice improvement (including following preventive screening guidelines), and workforce development, including use of community health workers to link populations to health services. Washington had, and continues to have, a robust response to the HIV epidemic and has developed strong infrastructure to support people with HIV, including ways to support purchase of insurance and medications and a cadre of people with real expertise in case managing those with chronic infectious conditions. We and our partners are working to apply this expertise to hepatitis. And, of course, we now have new, better medications. It will take some work to figure out access issues and cost issues, but I can’t help but think about how we were able to significantly change the trajectory of HIV when new medications became available in 1996, and what opportunities we might have for hepatitis today. For people with hepatitis C, there are many opportunities ahead of us to raise those bars and get more people diagnosed, linked to care, treated, and cured. But we also want to stay ahead of this epidemic by preventing new cases in the first place. We’ve heard about increasing new infections in young people who inject drugs and that’s something we’re seeing in Washington, too. Getting people in this population who are infected with hepatitis C cured could contribute to reductions in infections, but only if primary prevention is combined with access to broader health services. In addition to, and because of, the opportunities that I just mentioned, we have some new opportunities to address drug user health in a more comprehensive way. Washington State has been in the forefront in terms of support of syringe service programs. However, it’s clear that infectious diseases are only one of a myriad of negative health outcomes experienced by people who inject drugs. Other outcomes may include overdose and chemical dependency, to name a few. This is a population that experiences health disparities in a significant way. We are looking to bring more partners to the table to provide comprehensive health services to people who inject drugs, services that include, but are not limited to, access to sterile syringes. Later this month, NASTAD will be convening a group of states to talk about how to move forward with this work. Over the summer, we will be consulting with a variety of partners to update our plan to address hepatitis C in Washington State. Partners who have already stepped forward include the Hepatitis Education Project, AIDS Service Organizations, the Department of Corrections, and we expect others will, too. Thank you again to the Department of Health and Human Services for providing the framework of the Viral Hepatitis Action Plan to help guide our work, and for recognizing the important role that state health departments play in addressing hepatitis in this country.